* You would think a book about a building and especially this building would have a decent floor plan but there is none. William Storrer's definitive The Frank Lloyd Wright Companion has computer generated plans of every Wright building. The spread in his book on the Guggenheim has a plan for the lower, ground and first levels. Someone should have asked permission to reproduce these. *There are many letters from individuals and organizations reproduced in the book. The editors obviously thought they had some significance but twenty-five of them are reproduced just too small to read. I get the impression that the designers just used them as graphic fillers to liven up the pages. * Although there is no overall floor plan of the Museum there are many plans of part of the building and colored sketches showing design ideas but like the letters these have been reproduced too small so they are useless. *The book's designers have created a page grid and followed it by squeezing in photos, drawings, newspaper clippings and other graphic material without any regard to what the reader might want to see. This creates excessive amounts of white space throughout the pages and was particularly noticeable in the seventy-seven page Timeline section at the back of the book. Probably more than a third of each page is just white paper. So many photos and graphics really should have been much larger but aren't because then they wouldn't follow the page grid. *The curse of tiny type lives on in this book. (Why is this so prevalent in 'designed' books?) Captions and page numbers are in six point and printed in a darkish orange. Footnotes are also in six point but printed in black. Considering how wide the margins are on each page these footnotes could easily have been accommodated on the relevant pages. Fortunately the book's main text is a quite readable nine point. * There is no index. How is that possible? The absence suggests, to me at least, that the whole production has been created in a very slapdash way. As to the text, well, I'm happy to say this does deliver something for your money. 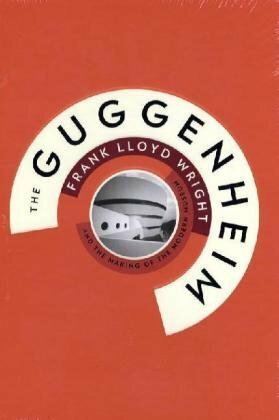 The seven main chapters cover FLW and his masterpiece in detail and I thought the first two: Hilary Ballon who looked at the origins of the Museum in New York and Joseph Siry who covered the construction in relation to other later museums, particularly interesting. The extensive Timeline section in the back pages was quite fascinating as you read about the many problems Wright had with the authorities and individuals. It turns out the Guggenheim was his most challenging commission. The book's last essay, by Angela Starita, covers the recent updating of the building in 2005 to 2008 and she provides a wealth of detail about the physical structure and the corrections made to the original. As I said in the beginning this could have been a wonderful book but it falls far short of my expectations essentially because of the inadequate work from Pentagram, who designed it, and the editors who didn't pick up these fundamental errors. The Guggenheim spread in William Storrer's magnificent 'Frank Lloyd Wright Companion' which has plans of every FLW building. Lower level from the 'Frank Lloyd Wright Companion', from Storrer's book. First level, from Storrer's book. Ground level, from Storrer's book. Right bottom: A good example of where the book falls down. Reproducing interesting looking plans this small is a nonsense. A spread from the seventy-seven Timeline pages in the back of the book. Plenty of space to make the two photos much larger without destroying the page design. Left bottom: There are so many totally unreadable letters reproduced throughout the book. What is the point of including them if they can't be read?